check Modular system developed by JOMY. 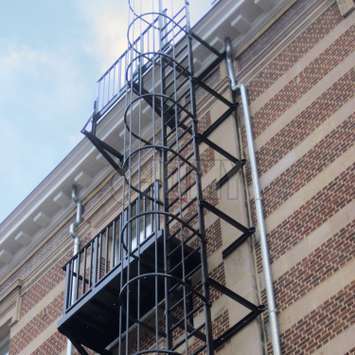 The JOMY Cage ladder is assembled out of standard elements that can be joined together by joint interlocking uprights. The rungs are inserted and snapped in the uprights, and are ribbed on the upper-side to avoid slipping. 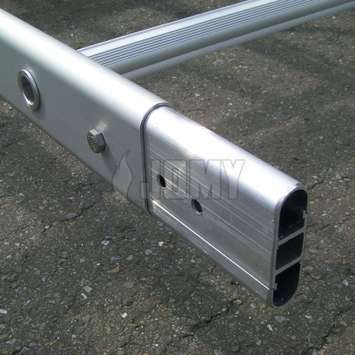 The uprights, the rungs, the interlocking uprights and the wall mountings are all made from extruded aluminum profiles that have been anodized. Fasteners are in stainless steel. 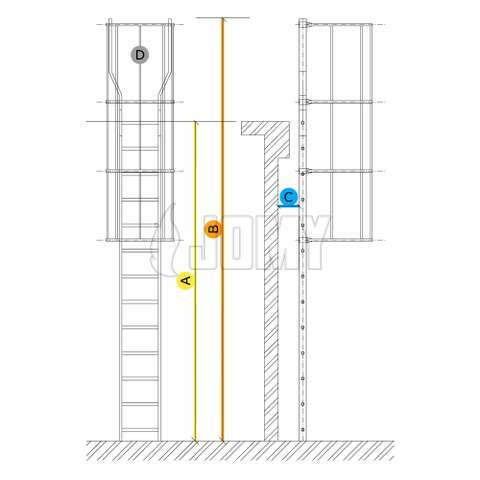 JOMY cage ladders comply with prevailing ISO, EN and OSHA standards. We have specially designed fixing clamps to connect the wall mountings and cage to the uprights. They can be installed fixed or free moving. The fixed position is used to attach the cage to the uprights. 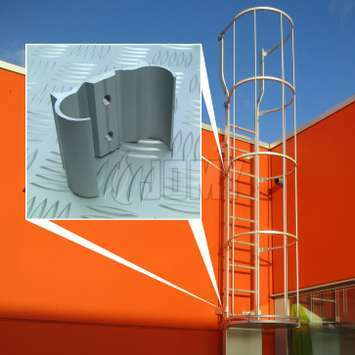 The free position is used to attach the wall mountings to the ladder, thus allowing non-destructive deformations due to the different thermal expansion of the building and the ladder. This protection can be a half round, 3 quarters or full. 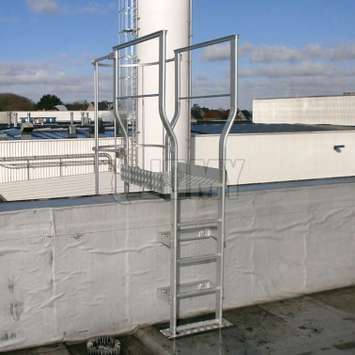 According to the standard ISO 14122-4, a cage needs to be foreseen on a fixed ladder once it is higher than 3 meters. 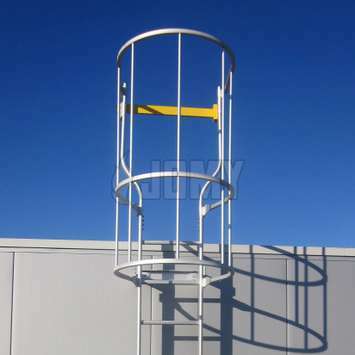 Our aluminum safety cages are made of hoops made from square profiles in which 5 vertical tubes go through. 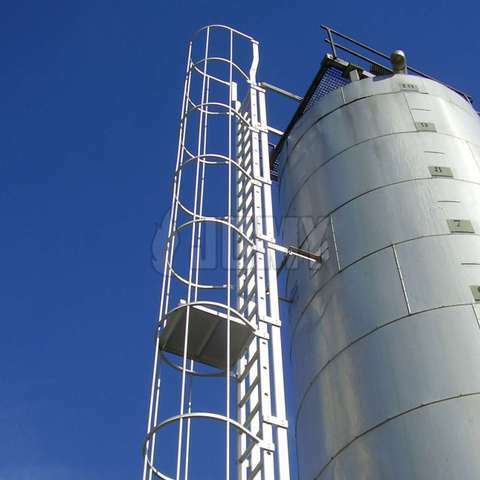 A flared cage entrance can also be provided in compliance with OSHA rules. 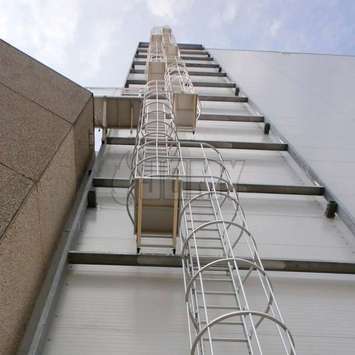 According to the ISO 14122-4 standard (machinery access) and OSHA rules, permanent ladders in one piece cannot be longer than 30 ft or 10 m. Longer ladders need to be composed of multiple fights, each of which can be at most 19’8” or 6 m long. The user can switch from one flight to the next via rest-landings. The ideal anti-abuse solution: product page. JOMY has solutions to cross over any type and form of roof edge. 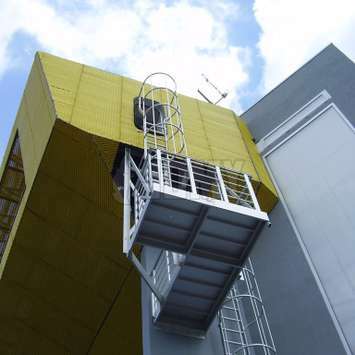 Whatever the roof configuration, the cage ladder will be accessed under the safest conditions. 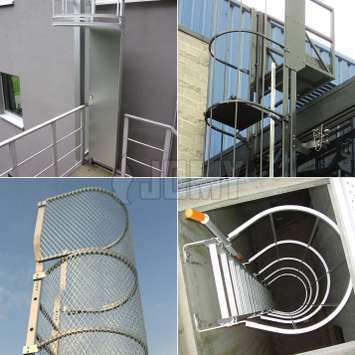 This access can be made safer with widened upright extensions, with or without a cage. A safety door can also be added for even greater access protection. 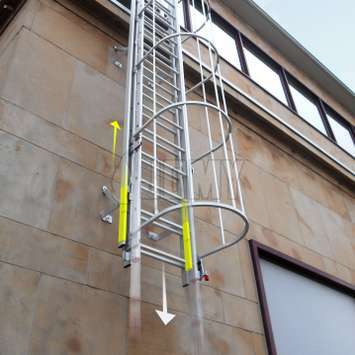 For a safe access to the ladder from the top or the middle, JOMY can provide custom-made landings in anodized aluminum made to fit your specific requirements. 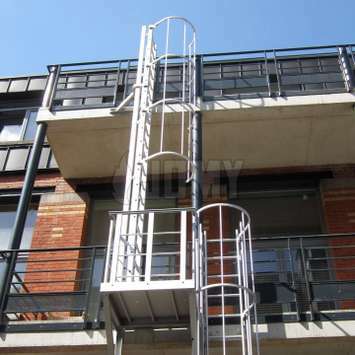 JOMY cage ladders can also be made entirely according to your specific requirements. Direct shipping of kit from our warehouse in Illinois.